Just before Christmas an email was circulated round the students of my university pointing us in the direction of a massive stack of free books, all those that been entered for a competition rewarding experimentation within fiction. I grabbed, roughly, angrily, rapidly, a stack of several that I judged entirely on their covers. This one I picked because of its title. To me, the word Vauxhall brings one thing to mind: homosexuality. I’ve been to infamous cabaret night Duckie at the VRT, I’ve picked up flyers for alternative pantomimes, I’ve seen enough leather getting on and off the tube there (while travelling to to/from the gentrified bits of Brixton) to feel I have the vibe of the place down. Vauxhall is big and gay and a little bit grittier than it’s uptown cousin, Soho. Right? I saw a novel with a bright blue cover and the title in a phallic red flame and pounced – this was, I presumed, going to be a big, beefy novel about big, beefy gays. It turned out to be absolutely nothing like that. 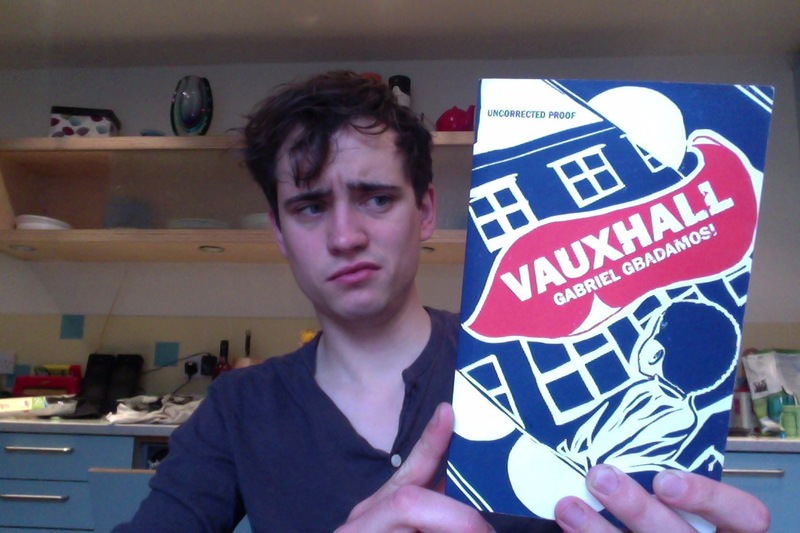 Gabriel Gbadamosi’s Vauxhall is, instead, an episodic novel set in the 1960s amongst the fraught immigrant community living in slums just over the river from the Houses of Parliament. The main characters are children, the first English born generation of those who headed to London for a better life. Some, like the father of the protagonist, have come from Nigeria, others from elsewhere in Africa, the Caribbean, Europe and several, such as the protagonist’s mother, from (closer) Ireland. The question and the key issue for everyone is identity – the central children have African names at home, but Irish names at school; Michael, the focus, discovers, slowly, the perceptions other people make of him and his family based on their ethnicity; he hears men leer at his mother in the market, then spit with disgust when they notice her mixed race* son; he is banned from being friends with other children at school due to the prejudices of the generation above, yet awareness of race is far from the minds of every character under ten. Along with sexuality, racial consciousness is not something that troubles Michael. He is about six, seven, possibly eight, during the course of the novel, and he is innocent; he explores the world around him, the unfixed bomb sites, the abandoned buildings, the world by the river, the houses and the pubs and the shops and the schools of people he knows; he makes friends with traveller children, with white kids the offspring of career criminals, with old people, with young people; he sees the corpse of a homeless person, he watches a child fall from a first floor window, he sees parties and celebrations and fights and separations; the novel comprises lots of short stories, really, but what builds is a sense of the inevitable ending of this broadly successful multicultural community based in houses the council has condemned. Most people treat each other well, certainly the children do, and the only people who speak with negativity of Michael’s parents’ marriage are those with no connection to it – the Irish community and the Nigerian community both accept the relationship, and both mother and father are involved in the cultural life of the other’s diaspora**. This is a pleasant, often sweet, peacefully tragic novel about a place and a period I knew nothing about. It feels real, it feels honest, of many rounded and intriguing characters working hard for themselves and for their families. It was interesting, for me, to realise that a district of London I think of as a bit of a party destination was once famed for its “slums”; it was enjoyable to read about how recently the reputation and the vibe of Vauxhall was so very different. Gbadamosi’s novel is slow but engaging, it didn’t make me laugh and it didn’t make me cry, but it made me aware of a more real and a more human sense of pleasure and pain than other novels might. I shared in the joys of his child protagonists and felt the horror of the destruction of their home, but never felt like my reaction was being forced. The prose works well. * Is “mixed race” acceptable?